Follow my YouTube Channel: The Readathon: Book Reviews and More! “Jack Elliot dreams of being the captain of his own ship. But then his grandfather, the Earl of Stansworth, names Jack as his heir–with a caveat. Jack must impress the aristocracy, or else his mother and sister will remain in poverty. Can a rough-and-tumble captain be transformed into a gentleman of society? Ivy Carlisle is willing to try. 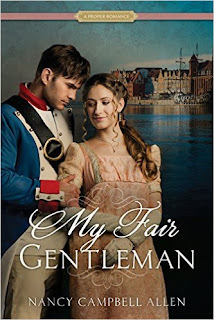 Employed as his tutor, she begins teaching Jack the ways of high society, but she quickly discovers that this dashing sailor is brash and bold, opinionated and passionate. If she’s not careful, Jack might end up teaching her a thing or two about romance. This is one of those books that you read for pure entertainment. It’s predictable, cheesy, and cliched, but isn’t that what we all want in a romance? I thought it was a sweet love story, with some crazy accidents added into the mix. The characters are fairly well done. I liked Ivy a lot. She has a cute personality, is likable, and seems realistic. I liked all her “properness.” (Yes, I just made up that word.) I could picture her all prim and proper, and yet I liked that she learned to bend those rules if the situation warranted it. I liked Sophia too. I liked the relationship between her and Ivy, and I also liked the relationship she had with her brother Jack. Jack is an interesting character. I didn’t like him very much at the beginning of the story. He seemed too irritable and grumpy. He wasn’t very kind. As the story unfolded, though, he has some experiences that seem to soften him a bit. He was a much better character at the end of the book. This is a fast, easy read, and may not be too deep or require a lot of thought, but it’s perfect for just being entertained; getting caught up in a story and being transported to a time of Earls, fancy balls, and rolling estates.